St. Martin's Press, 9780312339081, 206pp. What could be better than an authentic Italian dinner like this that takes only thirty minutes to prepare?
. how to use seasonal fruits and vegetables to greatest effect. For good measure, Mary Ann adds a dozen "Pronto " menus to show readers how to combine the dishes, as well as a select list of mail order and online sources for specialty items. So, instead of bringing home fast food or prepared frozen dishes from the grocery story, involve the whole family, spend thirty minutes with Mary Ann, and bring a little "la dolce vita"---as Italians would say, "the good life"--- to your kitchen. 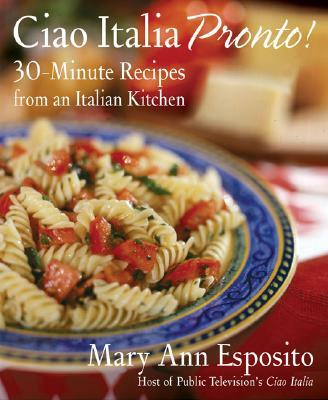 Without fuss or bother, Mary Ann Esposito shows you how to bring an authentic taste of Italy to the table for your friends and family. Mary Ann Esposito is the host of the public television series Ciao Italia, now in its fourteenth season. She is the author of seven successful cookbooks, including" Ciao Italia in Umbria" and "Ciao Italia--Bringing Italy Home." She lives in Durham, New Hampshire. "Italian food is by nature simple, and Esposito's everyday fare perfectly exemplifies that minimalism."